Our Correspondent ● Kolkata: Dhansere has published the first novel of writer Ramyani Choudhury, Eso Zero Muhurto (come zero moment), in a programme at the Jibanananda Sabhaghar on 9 November evening. Poet Subodh Sarkar and Syed Hasmat Jalal were the guests of honour at the book launch ceremony. Unwrapping the book, Sarkar congratulated Choudhury for penning down sentiments of urban middle class in an immaculate way. He also mentioned that the contemporary Bengali literature is proud to have a true scholar like Choudhury who always write on sensitive subjects. Both Sarkar and Jalal have lauded Dhansere's owner Subho Bandyopadhyay for delivering such a quality production on time. 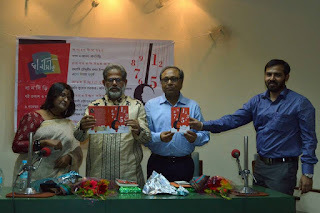 After the book launch a poetry reading session was held featuring Chaitali Chattopadhyay, Aditi Basuroy, Sridarshini Chakraborty, Samragnee Banerjee, Palash Dey, Abhimanyu Mahato, Souvik Bandyopadhyay and Sudip Chattopadhyay. The programme ended with Ramyani reading excerpts from the novel. She told that it’s a story about a couple and how their life gets entangled into current socio-political scenario.